Sometimes it takes a special nudge to get us to leave our comfort zone and try something new—even if it’s something we’ve been wanting to do for a long time. Today’s holiday provides that push by encouraging people to let go of the fears and doubts that hold them back. Whether you prefer to try new things a little at a time or decide to dive right in, you’ll feel happier and more excited by life if you reach for that gold ring when it comes around. One day, a child says, they got a chance. The chance seemed to know them, but the child wasn’t sure why it was there or what to do with it. The chance was persistent, but unsure, the child “pulled back. And so it flew away.” Later the child thought about that chance and realized they “had wanted it,” but even now they didn’t know if they had the courage to take one. Image copyright Mae Besom, 2017, text copyright Kobi Yamada, 2017. Courtesy of Compendium. The next time a chance came by, the child tried to grab it, but they “missed and fell.” They felt embarrassed, and “it seemed like everyone was looking at [them].” That was a feeling they never wanted again. Now whenever they saw a chance, “[they] ignored it.” They let so many pass them by that chances stopped coming. Then the child worried that they would never get another one. Although the child acted as if they didn’t care, they really did. They just didn’t know if they “would ever be brave enough” to take a chance. But then the child had a new idea and thought that maybe being brave “for a little while at the right time” was what it too. The child decided that the next time a chance came around, they were going to grab it. The child even went out to search for it, and then on a regular day, a glow appeared in the distance. Could this be it? The child was ready. Racing toward the light, they didn’t feel afraid; instead, they were excited. As the child got near, they saw that it was an enormous chance. As soon as they could reach it, they climbed aboard and soared wherever it took them. Now the child understands that when they ignore chances, they miss out on all the wonderful things they wants to learn and do and be. Whether the reader is a natural risk taker or on the more hesitant side, a child or an adult, Kobi Yamada offers encouragement and inspiration for those times when doubt or fear interferes with taking an opportunities when they come along. Kobi’s use of a first person narrator provides a level of comfort as the focus isn’t on the reader, but on feelings shared with a kindred spirit. Quiet children or those with anxiety will see that there are others for whom leaving their comfort zone is difficult. Kobi’s concrete language echoes the inner monologue of questioning, hope, embarrassment, and regret that can hinder people from trying something new or big. He also presents gentle, solid advice and reveals that small voice of determination and courage that does lie within most hearts. When the child finally grabs onto the greatest chance, readers will also feel emboldened and will be ready to soar too. Mae Besom brilliantly depicts the child’s contrasting feelings to be free, spontaneous, and courageous on one hand and secure and protected on the other through her use of space and color. The mystical, medieval-type town the child lives in is crowded, with homes wall-to-wall and stacked one on top of the other. The friends or family the boy follows walk together tightly grouped, and these are all rendered in charcoal, white and dusty yellow. In contrast, the chances—origami butterflies with long tails—are golden yellow and fly away from the town, touching down on the child’s reflecting pool, over fields, and into the vast sky. The child’s clothes are earthy brown, and the grass underfoot always green. As the child embraces bravery, animal companions also gain color, and as they all race toward the huge chance, they appear closer to the reader, filling the page. At last as the child soars on the wings of the chance, the town appears in the distance but is now also a place of color, light, and opportunity. Without gender pronouns and a child with neutral clothing and hairstyle, What Do You Do with a Chance? is universal for all children. The final book in the series, which includes What Do You Do with an Idea? and What Do You Do with a Problem?, What Do You Do with a Chance? is a must-own for home and classroom libraries to inspire discussions about overcoming fear, taking chances, and being yourself. The book will be an often-read addition to any bookshelf. Butterflies are a lot like chances. They don’t start right off fully formed, but go through different stages, waiting times, and some amazing changes on their metamorphosis from caterpillar to butterfly. Chances also take time, practice, and spreading your wings to be fulfilled. With this easy Colorful Clothespin Butterfly Craft, you can make your own butterfly that will always remind you to take a chance when it flies your way. When dry add accent dots or lines and eyes. I used a toothpick with the point cut off to make the dots on the purple butterfly. I used the pointy end of a toothpick to make the eyes and the lines on the pink butterfly. With the head of the clothespin facing down, insert the larger circle into the split in the clothespin so that half of the circle shows on either side. Next insert the smaller circle into the split and repeat the above step. If making a magnet, attach the adhesive magnet to the back of the butterfly. Tagged Books about Courage for Children, Books about Overcoming Fears for Children, Compendium, Inspirational Books for Kids, Inspirational Picture Books, Kobi Yamada, Mae Besom, picture book review, Picture Books, Picture Books about Chances, Picture Books about Opportunities, Picture Books about Overcoming Fears, Picture Books about Self-confidence, What Do You Do with a Chance? Just as the name sounds, today is a day to relax, let some things slide, and goof off! When the stresses and strains of everyday life get to be a little too much, letting go and having fun can put you in a better frame of mind and give you new perspectives. The holiday was established in 1976 by Monica Moeller Dufour of Davidson, Michigan. Now that you have permission to goof off and a whole twenty-four hours to do it in, plan some wacky events – or just snuggle in with a good book. There are no rules—so enjoy! Leo knew how to multitask. He could mop the floor and feed the bird at the same time (so…well… maybe the seed did miss the cage by a bit). But “no matter how hard he worked, there was always more to do.” Leo thought making a list would be a good idea. But once he started writing, the “list of things to do grew and grew.” For a moment, Leo wished there two of him. Suddenly, there was a knock at the door. Copyright Peter H. Reynolds, 2006, courtesy of Candlewick Press. When Leo opened the door, he, himself, was standing on the other side. The new Leo was keen to get started on the list. Two Leos was helpful, but the new Leo noticed more things to be done, so “a third Leo joined the two.” Three was fine, but four was even better. They shopped, swept up, went to the library for more books, and made important phone calls. But it didn’t quite work out that way. “With seven Leos, there was seven times as much work!” Leo decided they needed one more just to stay afloat. These eight Leos mopped and baked, played soccer and carted laundry, organized and took notes that led to needing another Leo. Surely, these boys could get it all done. So one typed while another played soccer and another washed the cat. The fourth Leo swept while the fifth walked the dog and the sixth practiced violin. The seventh made important phone calls and the eighth checked the list while the ninth went grocery shopping. Peter H. Reynolds’ books for young readers celebrate the wonders of childhood—those years that are so important in the development of the adult to come. Always encouraging of the interior voice of creativity and individuality, here Reynolds adds a tribute to time—the time needed to think, dream, contemplate, devise, and become. With his usual flair, Reynolds uses watercolor, ink, and tea to show readers—both kids and adults—what all that over-scheduled running around looks like from the outside. As the Leos proliferate, the pages go from sparse to full to packed until one page isn’t enough, and the list and the Leo’s spill over into a double spread. When Leo wakes from his nap and realizes one is enough, the white space around him provides a sense of freedom and lightness. As the pages of the list fly out of Leo’s hands and he plops down in a grassy spot, the end papers reflect Leo’s liberation. Whereas the opening endpapers of college-rule notebook pages are full of chores, meetings, and exhortations to do more, the final notebook-page endpapers are blank, giving readers a sense of Ahhhhh! Adding So Few of Me to home or classroom bookshelves and reading often can be a good reminder that time relaxing is time well spent. Match the chores to get them done. 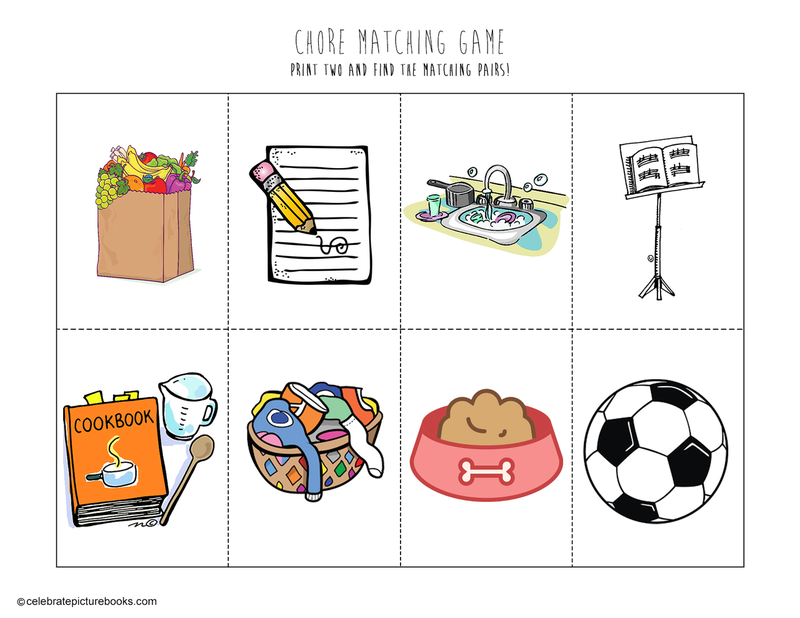 See how quickly you can pair up these chores and get them finished so you can run off to play. 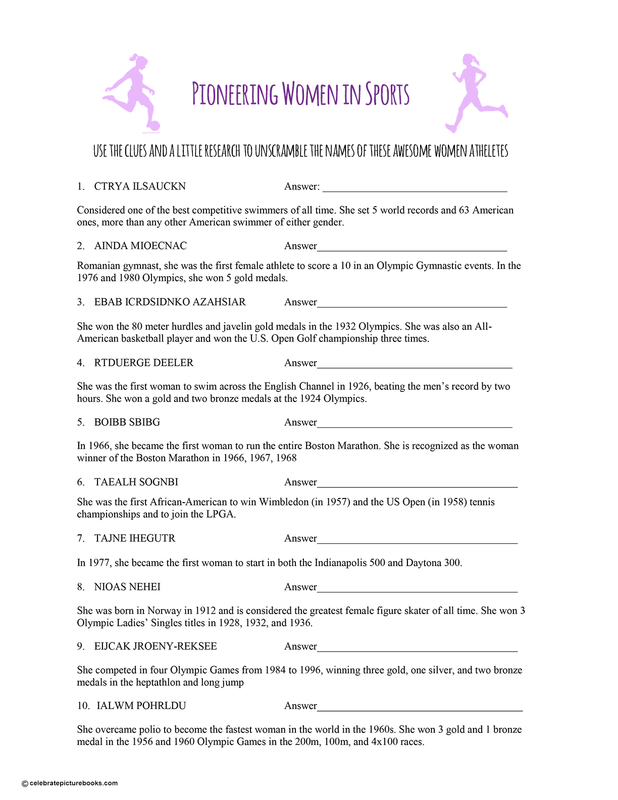 National Woman’s History Month was established by the United States Congress in 1987 to recognize and celebrate the achievements of American women in the past and today. This year’s theme is “Nevertheless She Persisted: Honoring Women Who Fight All Forms of Discrimination against Women” which provides an opportunity to recognize the tireless efforts of women in all walks of life who fight against discrimination to be heard and to achieve their goals. There’s no better time than now to get involved to ensure that all women have equal rights and standing in all areas of their lives. This superb collection of biographies in verse highlights not only well-known pioneers but some delightfully fresh names and a few who are influencing the arts, science, and cause of human rights today. Each of the women profiled show the qualities of bravery, persistence, intelligence, and ability over a vast spectrum of fields. Their success led the way for today’s women and will inspire tomorrow’s. Image copyright Shadra Strickland, 2018, text copyright Susan Hood, 2018. Courtesy of HarperCollins. Organized on a timeline from the early 1780s to 2014, Shaking Things Up begins with Taking the Heat and Molly Williams, who was the first known female firefighter in America. When the flu knocked out all the members of the Oceanus Fire Department and a fire raged, Molly, the servant of James Aymar, a volunteer fireman, “… knew the drill; / she’d seen what must be done. / she hauled the pumper truck by hand, / adept as anyone.” For her work she was named Volunteer 11 and made part of the crew. It took about two-hundred years before another woman—Brenda Berkman—was added to the New York Fire Department. Copyright Hadley Hooper, 2018, courtesy of HarperCollins. Image copyright Hadley Hooper, 2018, text copyright Susan Hood, 2018. Courtesy of HarperCollins. If it weren’t for Annette Kellerman, women may never have made such a splash in swimming. Kellerman was a champion swimmer who began the sport to strengthen her legs after having rickets. Turning the Tide reveals that when she took to the water “without pantaloons—her swimsuit was deemed obscene!” After she was arrested she calmly stated, “who can swim fifty laps / wearing corsets and caps? / Her statement could not be contested,” and she went on to create the modern one-piece swimsuit, changing swimming for women forever. In The Storyteller, a full alphabet of attributes describes Pura Belpré, a children’s librarian and the New York Public Library’s first Latina librarian. By offering—and often writing—Spanish books and creating programs for the Spanish-speaking community, Belpré revolutionized her library and touched many lives. Copyright Lisa Brown, 2018, courtesy of HarperCollins. Image copyright Sophie Blackall, 2018, text copyright Susan Hood, 2018. Courtesy of HarperCollins. Image copyright Selina Alko, 2018, text copyright Susan Hood, 2018. Courtesy of HarperCollins. 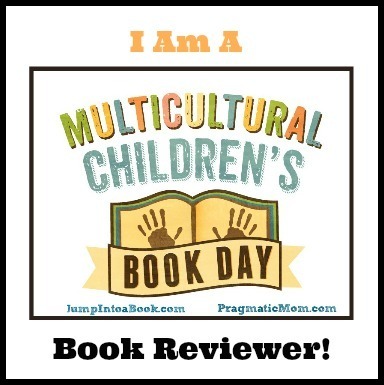 Also included are poems about artist Frida Kahlo, World War II secret agents Jacqueline and Eileen Nearne, anti-hunger activist Frances Moore Lappé, civil rights pioneer Ruby Bridges, architect Maya Lin, and Noble Peace Prize winner Malala Yousafzai. 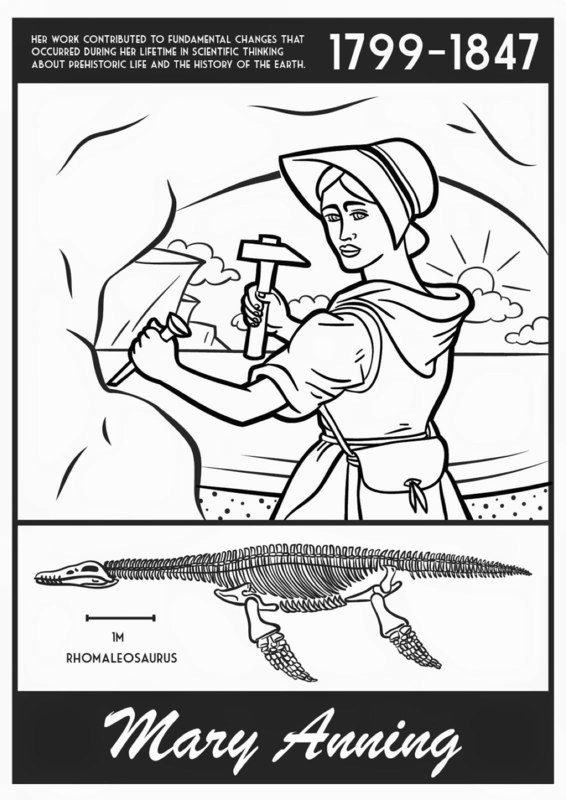 An illustrated timeline precedes the text, and suggested resources for further study on each woman follows the text. 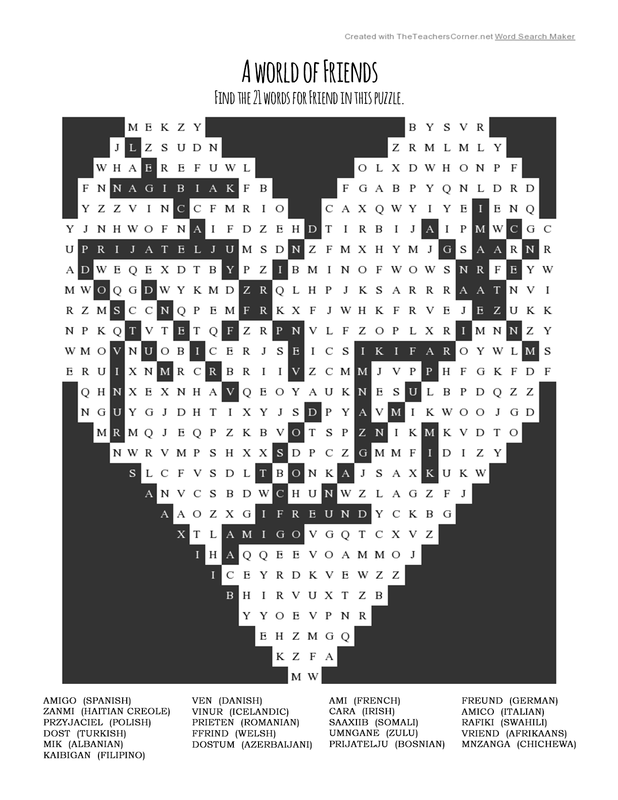 Susan Hood has created fourteen poems that are as unique as the woman they describe. Some rhyming and some free verse, the poems include facts, quotes, intriguing details and the rhythms, sounds, and dreams of these young women. 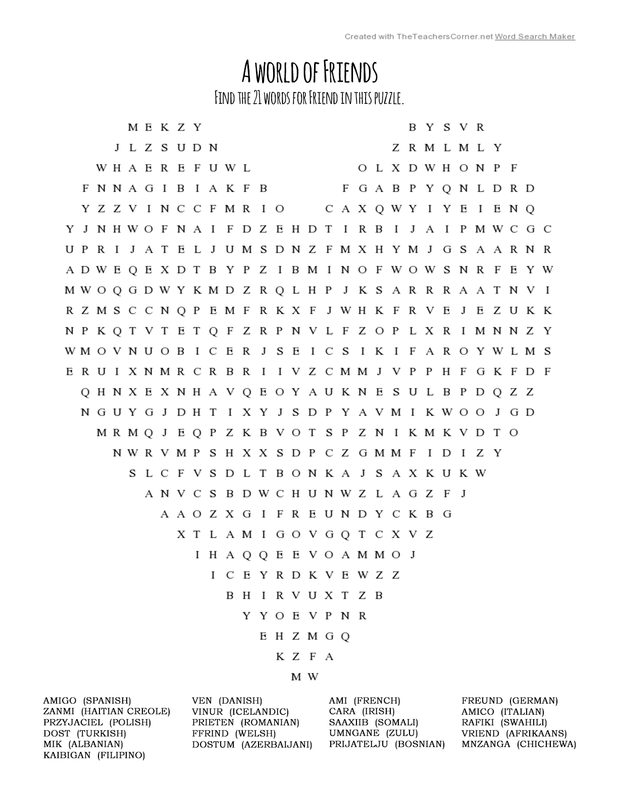 A paragraph following each poem reveals more about the woman and her work. Readers will be awe-struck by the enticing stories that inform each lyrical biography and will long to learn more about the women and their lives. The theme of individuality is carried through in the illustrations, which are each created by a different illustrator. Colorful, whimsical, and realistic, the illustrations let children see the faces of the women presented, surrounded by their work and set within their time period. Readers will want to linger over the images and discuss the details included. A quotation from each woman accompanies her illustration. Shaking Things Up offers an inviting way to introduce children to these amazing women and is an excellent reminder that they too can dream of what could be and make it happen. A must for classroom and school libraries, the book would be an inspirational addition to home bookshelves as well. Discover more about Susan Hood and her books on her website. Check out the Shaking Things Up book trailer! 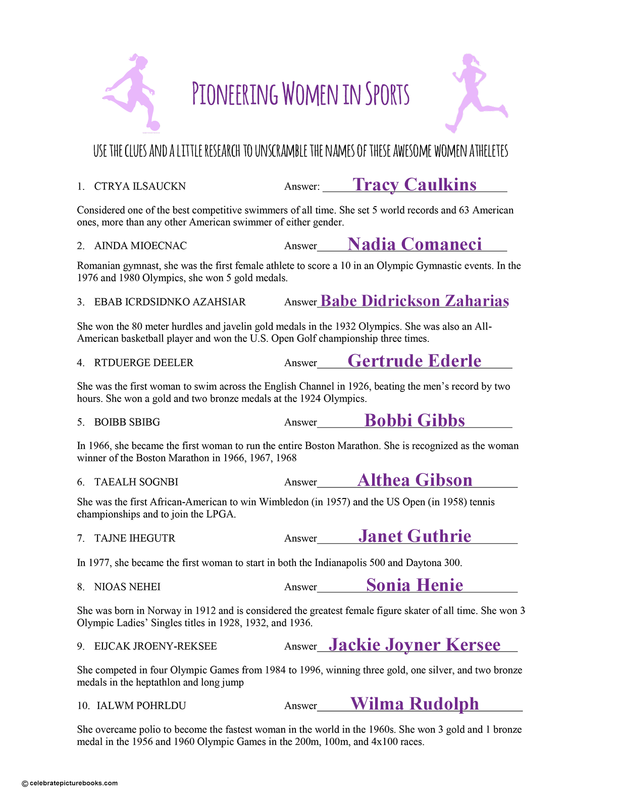 There are so many incredible women to learn about during this month. 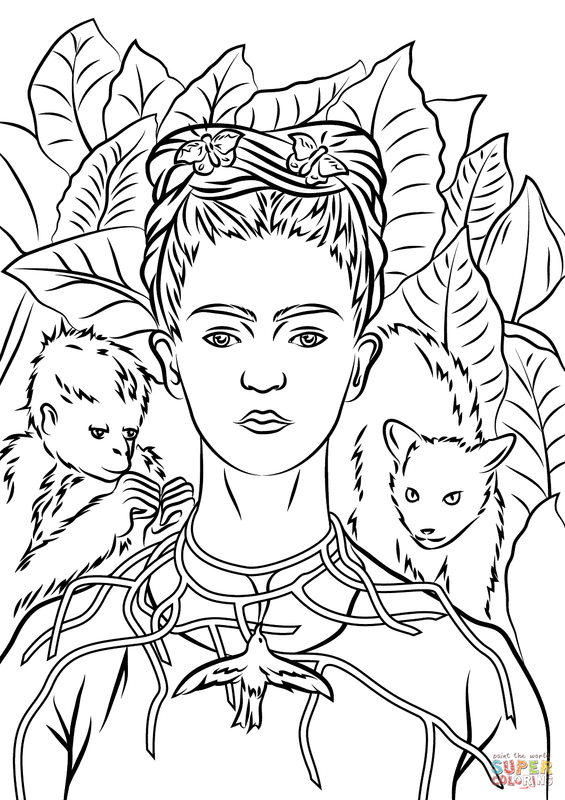 Today, enjoy these coloring pages of inspiring women. It can be fun to try out new names or special nicknames in forming your identity. For those who are not so fond of their birth name, choosing a new name offers comfort, control, and happiness. Actors, writers, and other creative types sometimes change their name to something that is more memorable, easier to say, is flashier, or has more cred. To celebrate today’s holiday, try on a few different names. If you were going to change yours, what would you pick? Mom opens her daughter’s bedroom door with a cheery “‘Good morning, Isabella. It’s time to get up and out of bed.’” But the little girl yawns and stretches and most emphatically states, “‘My name is not Isabella!’” Mom plays along, wondering who has then been sleeping here. 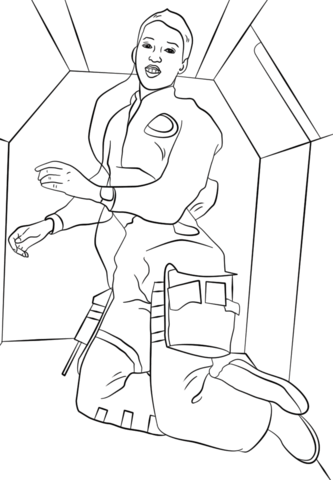 “‘My name is Sally,’” Isabelle states, “‘The greatest, toughest astronaut there ever was!’” Having Sally Ride in the house is fine with Mom, as long as she puts on her space suit and comes down for breakfast. Image copyright Mike Litwin, 2010, text copyright Jennifer Fosberry, 2010. Courtesy of Sourcebook Jabberwocky. When the little girl comes to the table, it seems she is no longer Sally. Hmmm… her mother says. She doesn’t know who will eat the delicious waffles she has made. Annie, the greatest, fastest sharpshooter, grabs the syrup and aims for her target. Her mom is happy to see Marie and offers to get the cookies while Marie discovers the answers to her homework. Well, the cookies must fill Marie up, because when dinner rolls around, Elizabeth Blackwell shows up to set the table. At bath time, Elizabeth doesn’t feel like soaking in the relaxing bubbles, so she sends “‘Mommy, the greatest, sweetest mother who ever was,’” instead. Image copyright Mike Litwin, 2010. Courtesy of Sourcebook Jabberwocky. In Jennifer Fosberry’s inspiring story, it’s not that the little girl doesn’t want to be Isabella, it’s that she wants to be the best Isabella she can be. In thinking about her role in the world, she’s chosen to emulate five of the most amazing women the world has ever known—and that’s just on day one. Fosberry’s ending, with its view toward tomorrow, allows children to consider all of the influential women throughout history and working today as role models. Her inclusion of “Mommy” as one of Isabella’s heroines is a welcome tribute to the job of motherhood. After all, it’s clear from the way Isabella’s mother supports her daughter’s alter egos without a “Sally who? or a “Rosa who?” that she has taught Isabella about these “greatest” women. It’s just one lesson this mother—and all mothers—teach their children. Short biographies and portraits of Sally Ride, Rosa Parks, Annie Oakley, Marie Curie, and Elizabeth Blackwell follow the text. A book that will charm as well as educate, My Name is Not Isabella is a classic that makes a great introduction to the women mentioned in the story and can spur further discovery for younger readers. It would be a welcome addition to home and classroom bookshelves. Discover more about Jennifer Fosberry and her books on her website. Learn more about Mike Litwin, his books, and his art on his website. You can show your pride in your name (or play with changing it) with this easy craft that will keep all your books tidy on their shelf! This makes a great gift too! Sturdy wooden letter blocks in the child’s first and last initials. Or, if the child would like to try on a new name or nickname, the first letter of their new name. November has been designated as a time for reflecting on our lives and being grateful for our family, friends, opportunities, and the things we have. Often—as today’s book emphasizes—it’s good to look closely at the Now and not worry so much about the future in order to truly appreciate our particular gifts and the positive things in our lives. To celebrate Gratitude Month, take time to count your blessings and thank those who are important in you life. A girl, barefoot and with her arms raised high, runs through a field, feeling the exhilaration of the wind on her face. “This is my favorite breeze,” she says. She finds an apple-red maple leaf, which, at this moment, is her favorite. At the beach, she has dug hole after hole, but her favorite is the one she is making right now. Copyright Antoinette Portis, 2017, courtesy of us.macmillan.com. The most marvelous tree has sturdy branches for the girl to swing from, and a delicate, bell-shaped flower produces her “favorite smell.” There are many birds to feed at the park, but the one she likes the best is the one that comes close enough to eat out of her hand. Her favorite song is the one that swells inside her heart and bursts out with joy, and the most delicious gulp and bite are those that quench her thirst and calm her hunger. Antoinette Portis lends her unique perspective to this uplifting book that encourages kids—and, as readers see in the final image, adults—to live in the moment and become fully conscious of the present object, feeling, experience, or sensation. As the little girl’s favorites build on each other, readers become aware of a growing appreciation for all the small joys that make up a day. The theme of the book is revealed on the first page as the girl welcomes the refreshing breeze. The simply drawn, unencumbered illustrations mirror the simple pleasures that she finds everywhere. But look closer and there is more profound meaning in each. The veins in the maple leaf become the girl’s smile as she holds it to her face; her song radiates from her in a golden sun-shaped swirl; and the girl’s clothing changes through a year’s worth of experiences as it also matches the color of her feeling or activity, allowing her to become one with it. As readers reach the end of Now, they see two hands holding a book open to an image of an elephant and her calf, animals known for their strong family ties. This illustration leads into and strengthens the final page, where the girl and her mother sit reading that book together. The text and picture work in tandem to embrace the reader while letting both children and adults interpret the previous images in their own way. Now is a beautiful, quiet book that reminds children and adults to slow down and truly enjoy the fleeting moments of life. It is a wonderful book to share and will open discussions of “favorite things” for home, classroom, and library story times. To learn more about Antoinette Portis and her books, visit her website. Things to be thankful for are all around you! What do you see? 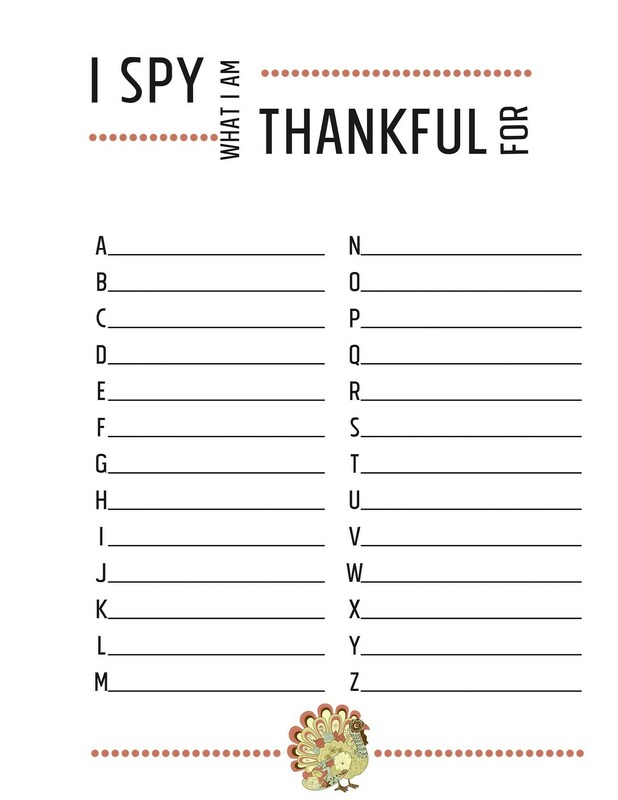 Find an entire alphabet of favorite things with this printable Alphabet I Spy Gratitude Game Page!